I have put together a few solutions based on a number of “garage” fixes to get Zytel magazines up and running again. 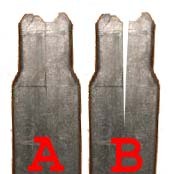 Worn feed lips are the result of the bolt rubbing on the top of the magazine as the gun cycles. Since the Zytel material is not as “hard” as the metal used in the bolt it wears over time. 2. Purchase steel replacment feed lips (pictured on the right). These feed lip replacements can be bought from LAGE’s website and if you follow the installation instructions you should be good to go. This solution may not work if your feed lips are far to worn already so its best to install these on a new Zytel to prevent future wear. Malformed / Bent feed lips are usually the result of the magazine being overloaded or loaded to capacity. Overtime the spring pressure forces the Zytel feed lips to become malformed and open up. This condition can get so bad that the magazine will barely hold rounds inside the magazine. There are a number of ways to do this, and none of them are guaranteed to work. First take the magazine completely apart and remove the follower, floor plate, & spring. Now we must heat the magazine up so the material is flexible enough to bend he feed lips back into shape. You want to heat it up just enough so the material is flexible with pressure. Take it easy or else you can turn your magazine into a gooey mess. It is a good idea to use a pair of pliers to hold the magazine as you heat it up so you don’t burn your self. The best way to prevent the magazine from melting is to heat it up a little bit every time and attempt to bend the feed lips with pliers back into shape. You will need a good Zytel magazine on hand to compare the feed lips to so you know when to stop bending. Most people heat the end of the magazine up with a hair drier or by placing them in boiling water for about 5 minutes. Once you have the magazine heated up, bend the feed lips into shape so they match the feed lips on your good Zytel magazine. Once you have them corrected place the magazine in your freezer for an hour or so. After the magazine has been cooled down put it back together and load the magazine to see if the bullets feed angle matches that of your good loaded Zytel magazine. If the feed lips are off a little repeat this process. I am not going to lie to you, this fix may ruin your magazine if you heat it up to much so go slow. 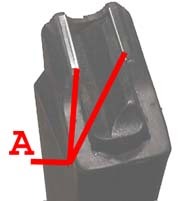 Split magazine housings are the result of a zytel magazine being loaded near or over capacity over time. Basically the glue that holds to two halves of the magazine together comes unglued and the magazine splits. There are a number of ways to do this, and none of them are guaranteed to work. I have used this method with split Ruger 10/22 magazines with decent results. Go to the hardware store and purchase a strong two-part epoxy, such as J-B Weld. While you are there pick up some 320 or 400 grit sand paper. What you want to do is clean up the inside of the split area with the sand paper to remove the old glue and give the epoxy a fresh surface to bond to. At this point I use electrical contact cleaner to clean the area where I will use the epoxy. A cheaper alternative is to just use rubbing alcohol. When the area is clean and free of old glue, mix the epoxy you purchased and apply it to the inside area of each magazine half’s seam. When you have the epoxy placed press the two halves together and clamp them together with a c-clamp. Let it dry for about a week. If you did this correctly the magazine should be “one” again.